INTERNATIONAL Exhibition Services (IES) continues to maintain its reputation for organising high quality international trade events in established, as well as the world’s new emerging market economies. 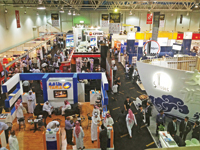 Adaptable to the diverse and variable market conditions that exist in today’s global marketplace, IES began operations in Saudi Arabia in 2007 and now has a broad portfolio of trade exhibitions representing the key sectors in the kingdom, including oil and gas. The exhibitions are hosted in partnership with the Dhahran International Exhibitions Company. Tha Saudi Arabia International Oil and Gas Exhibition and Conference (Saoge) was launched in November 2008 as the premier event for the oil and gas industry in Saudi Arabia. It was established to meet the requirement for the largest oil producing country in the world to host its own focused oil and gas show. In September 2012, the fourth edition of Saoge was officially opened by Prince Mohammad bin Fahd, Governor of the Eastern Province who toured the exhibition to meet with a number of the major companies including Taqa, Kanoo, Sinopec, CPTDC, Abdulla Fouad and Al Abdulkarim Holding who participated at the Saoge 2012. The fifth Saoge will be held from November 25 to 27, 2013 in Dammam, Saudi Arabia. This event gives exhibitors the opportunity to join more than 250 private and public companies, research institutions, government agencies for the only show that gathers all the oil and gas leaders working in the Eastern Province of Saudi Arabia under the same roof, sharing the common aim to promote themselves, strengthen business relationships and at the same time find new projects and opportunities. Saoge has an impressive global representation from participating countries including Argentina, Belgium, China, Egypt, Finland, France, Germany, Holland, India, Iran, Bahrain, Saudi Arabia, Malaysia, UAE, UK, Turkey, Tunisia, The Netherlands, Singapore, Pakistan and Qatar. Piero Zipoli, president of IES, comments: “We pay special attention to the Saoge and regularly see great demand from multinational companies to participate and be at the heart of the industry. Saoge clearly offers them a platform for more insight into the possibilities for new investments, developments and technologies, aimed at the global petroleum sector”. In addition to the considerable industry endorsements that Saoge enjoys, Saoge 2012 was also supported by the Saudi Arabian Section of American Institute of Chemical Engineers (SAS-AIChE) and the Bilateral US-Arab Chamber of Commerce (BUSACC). The American Institute of Chemical Engineers (AIChE) is a professional society that provides a forum for the advancement of the theory and practice of the chemical engineering profession, and the Saudi Arabian section (SAS AIChE) holds meetings and company visits to support this. The IES team is extremely proud that Saoge maintains its position as the sole oil and gas exhibition in the Eastern province, and continues to deliver an essential platform for key industry professionals, specialists and decision makers. Within the global oil and gas sector, IES in addition, organises trade exhibitions and conferences in Europe, the Middle East and Asia. In developed economies, these events now form a vital part of the local marketing mix – whilst in emerging markets, the events provide a major stimulus for industrial and commercial development. The company also represents the interests of many international exhibition organisers across its network at the major oil and gas exhibitions, and operates in over 30 countries.